This work includes work by others with different licenses! See the OpenAL license for more information. OpenAL seems to be abandoned by Creative Labs. Maybe you should try OpenAL Soft or FMod instead. Choose the sound device you want to test. 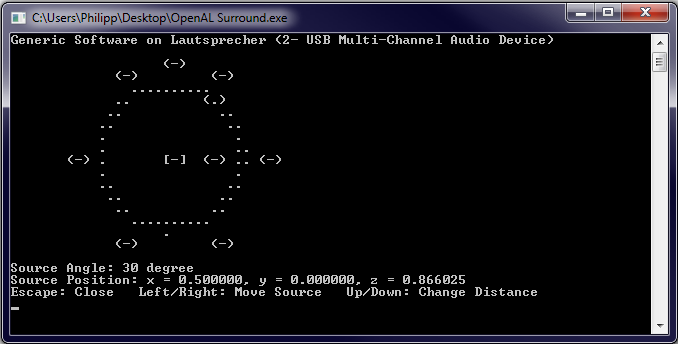 Then choose your speaker layout (Mono, Stereo, ..., 5.1, 7.1). Afterwards you can let a sound source circle around you. For example move the sound source to your left speaker and set the desired volume in your soundcard's manager tool. If this program only says that "OpenAL32.dll" is missing install the OpenAL DLL. 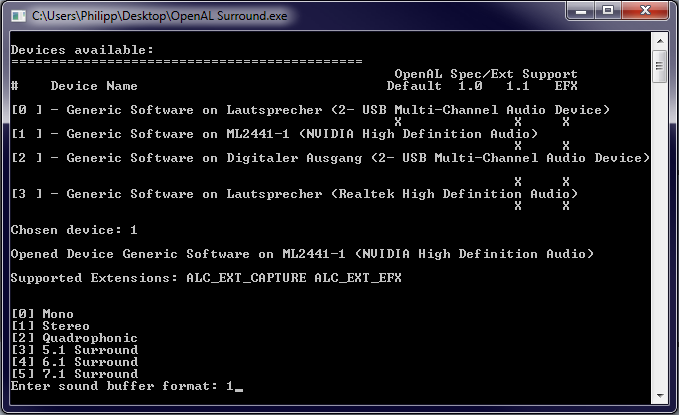 Note: OpenAL only guarantees to support mono and stereo sound of all sound devices. Make sure your sound device fully supports OpenAL to use the surround features.